Her grandmother suffered from mild stroke. 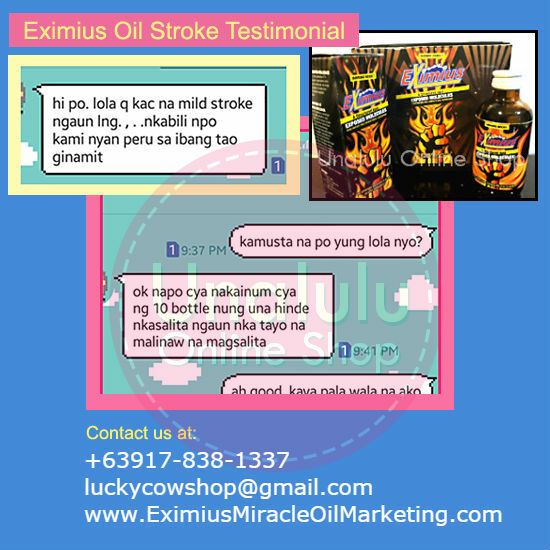 Since one of them already tried Eximius Oil and is satisfied with the effect, they are going to order again. Here's our text message conversation, translated into English (sorry for the rough translation). Her: Hi. My grandma had a mild stroke now. We already bought that one before but for another person. Her: She's now okay. She had took 10 bottles. At first she can't speak. Now she can stand and she can speak clearly.